A multi-vehicle crash south of Salina closed a portion of Interstate 135 early Saturday morning. According to the Kansas Highway Patrol, 19-year-old Ian Gerald Austin Cardwell of Abilene was driving a 2005 Chevrolet Silverado pickup truck, headed south on Interstate 135. He struck a guardrail and became disabled in the road. The disabled Silverado truck was hit by a 2007 Chevrolet Avalanche that came upon it. 1995 Acura Legend then then debris in the road and crashed. Cardwellwas transported by EMS to Salina Regional Health Center with a suspected serious injury. The driver of the Avalanche, identified as 23-year-old Herbey Hernandez-Rodriguez of Salina also was was taken to the hospital with a suspected minor injury. The driver of the Acura was not hurt. The crash, which happened between the Schilling Road and Water Well Road exits in the southbound lanes,was reported at 6:34 AM . It prompted first responders to close both lanes of I 135 headed south at the Magnolia Road exit, to Schilling Road. The road reopened at 9:45 AM. 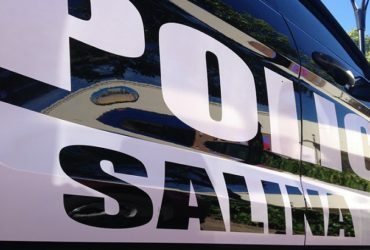 ORIGINAL: A multi-vehicle crash south of Salina closed a portion of Interstate 135 early Saturday morning. According to the Kansas Highway Patrol, the crash involved a semi and several passenger vehicles. It happened at around 6:45 between the Schilling Road and Water Well Road exits in the southbound lanes. The crash prompted first responders to close both lanes of I 135 headed south at the Magnolia Road exit, to Schilling Road. Officials tell KSAL News one person was transported by EMS to Salina Regional Health Center. At 6:42am @KHPDispatch advised of a multi-vehicle injury crash involving a semi/tanker and several passenger vehicles, on I135 SB near Schilling in Saline county. Salina PD is closing I-135 south at Schilling, and will be closed a significant amount of time.